Google's implementation of PageRank algorithm was a transformational moment for the desktop web. In the pre-PageRank era, scouring search directories for relevant websites and manually typing long URLs into a browser's address bar was common. Google's use of links as a "voting" system for discovering websites changed online discovery forever. The app interaction and discovery model prevalent today bears many similarities with the pre-PageRank era of the web, with apps listed under numerous app store categories. Google's Now on Tap may usher in the very "PageRank for Apps" era we have been waiting for. Today, users discover apps by browsing through app stores or through advertising / social channels and word of mouth. 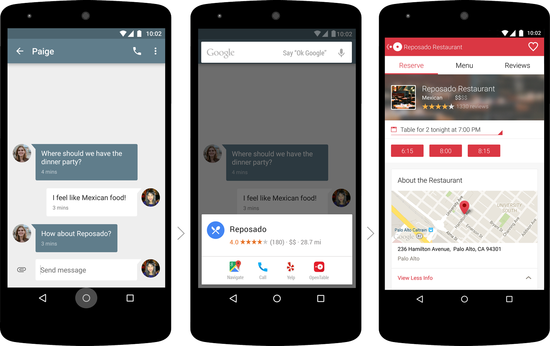 But now, Google is building ability to suggest apps to users based on what they require most at that very moment. In other words, instead of indexing websites and using links as the voting system, Google appears to be indexing apps and using live, in-app information as the voting system. This changes the workflow for users as jumping from app to app becomes much easier and completely cuts the smartphone homescreen out of the equation. Suffice to say, this has the potential to completely reshape the app interaction model as we know it today. If the service works as expected, launching an app from a homescreen may soon be as alien a concept as manually typing a URL into a browser's address bar. Of course, this also dovetails perfectly with Google's monetization model. Except for one, Now on Tap gives Google all the required assets to implement an Adwords-equivalent advertising model for the mobile era -- knowledge of user context (instead of keywords) and screen real-estate across all smartphone apps (instead the search page). The only missing ingredient is a contextual bidding system for ads on Now on Tap cards. This seems to be a few years away as well, but the direction of Google's evolution has now become clear. This also seems to have thrown a spanner into the Peak Google narrative we've heard so much about. This was inevitable as asymmetric business models (like Google's) have been continually misunderstood by pundits. Just as we saw in the case of post-IPO Facebook, critics ignored Google's investments into intermediate products and the assets gained from them. Now on Tap is the clearest possible indication of the latent value held by these assets.